After only two weeks, I went to the grocery store. I could’ve made it longer if I was truly out of cash (and SNAP benefits), but, I wasn’t. I got some staples and some fresh fruits and vegetables. And fig newtons (“fig bars“) because my younger daughter had asked to try them a few days before. On Saturday, I stocked up at BJs on some bulk items. Out of habit, I bought paper towels (that I returned before I left the parking lot). I ran out when I wasn’t going to the market and I’ve become a no-paper-towels aficionado. The length of time I go without visiting the grocery store may not be impressive. Despite this, the life changes for me have been significant. I value leftovers. My cooking is more efficient. I know (pretty well) what’s in my refrigerator, freezer, and pantry. I don’t get sucked into “screw it, I’m ordering a pizza.” We eat much, much, much better (whole) foods. I suspected my cooking habits would return to the glory days when I was a new mother with my first daughter. Freezing garden harvests, quinoa with molasses for breakfast, yoghurt in the crockpot. What I didn’t predict at all was the impact on my garbage. After picking a bushel of apples only to find they were infested with grubs, I needed to get rid of them. Certainly, I wasn’t going to put them all in the trash. I found a place for them (a woman who lives by the Starbucks I work at who has chickens and, it turns out, horses). I was nudged into finally signing up for Garbage to Garden. My ex-husband and his fiancé have been using this service for ages. Now that I’m using it, I can’t say enough good things. It’s amazing. AMAZING. Garbage to Garden: $11/month, a large plastic tub with a lid, all my organic waste goes in there, put it out with the trash, it gets picked up, new plastic tub is left for me. I also put out a jar with cooking oil (I made potato chips) that will be used in making biofuel. That’s it. That’s our family’s garbage for the week. 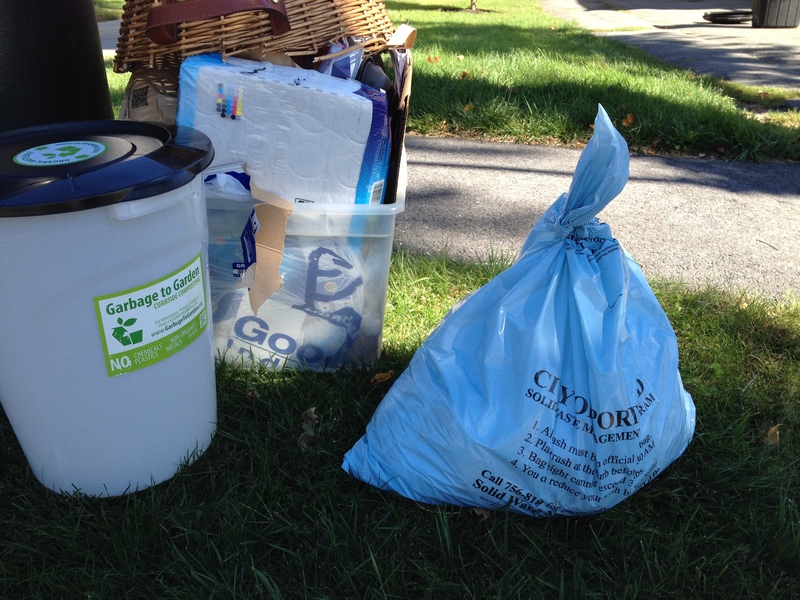 Mostly recycling, a 1/3 full Garbage to Garden, and one very not-full garbage bag. We used to have at least two, if not three bags so full I had to double bag them and put duct tape on the bottom. We rolled out our big trash can to hold the bags. Twice I dealt with maggots because the trash collectors don’t deal with broken bags (and I found that out the first time in the summer, once I just didn’t notice the broken bag was still in there). Assuming this will be a pattern, that I stick to mostly not going to the market for a couple weeks, then I buy staples, some fresh fruit and vegetables, and some treats (school lunches, etc. ), then I waft back into “I’ll just grab some bread since we’re almost out…” ending up with $75 of groceries. I’ll return to the “no groceries” challenge for myself. Restart. In any case, it’s one of the best things I’ve done for me and my family in a long time. This entry was posted in activism, assistance, environmental crisis, ethics of eating meat, mindful living, no groceries and tagged ethics of eating meat, mindful living, no groceries, priorities, values by serenebabe. Bookmark the permalink. It struck me this time that your no-groceries challenge is much as we live when we are anchored in some remote harbor. It is NOT as we have been living while in St. Thomas, USVI for a year, and that is one of the things that I don’t like about living here. It is too easy to use too many paper towels, purchase junk foods, purchase processed foods, spend more and have less. We ate better and for less in Grenada, where they had more fresh produce, where it was more difficult to get to the store, and where we could opt for “local” stores as opposed to the more “American” one. Isn’t it amazing, once you’ve gone “minimal” how seductive the “more” lifestyle is? It’s so easy to slide back into it. This time, it gave me a knot in my stomach when I thought, “Well, just this…” and frequently I’d put things back. Thanks for reading and commenting, Barb.